A last will and testament is a statement of a person's intentions for her property after death. A valid will passes assets to the persons the testator -- the person writing the will -- selects, rather than to blood kin she may not even know. It also enables a testator to name a guardian for her minor children. While many people use lawyers to prepare wills, this is not the only possible procedure. Testators with complex holdings or myriad heirs may benefit from using experienced estate attorneys to prepare wills. This procedure also enables estate tax planning. 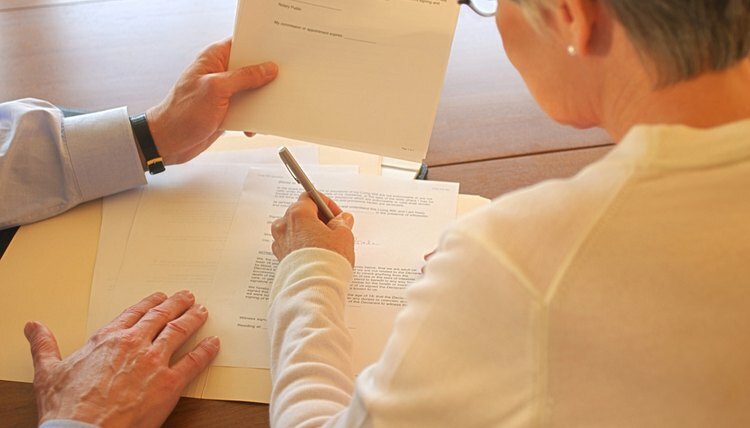 The testator outlines her devises to the attorney, providing information about property and heirs, and the lawyer drafts a will that incorporates these bequests. The testator and attorney often meet several times to review draft testaments and exchange information. When the testator approves the will, she signs it before witnesses in the attorney's office. Form wills work well for a testator with a simple estate. A form will is a document containing the skeleton of will, with blanks for the testator to insert identifying information about himself, his property and his heirs. A good form will is state-specific and contains all of the procedural requirements for a testament in a particular state. Form wills approved by a state's Bar Association are especially reliable. A testator using a well-drafted form will avoids having to do research on technicalities such as the number of witnesses required in his jurisdiction. Some states make form wills even more accessible by including one in their statutes. California and Maine are among the jurisdictions providing a valid form will for its residents in the probate code. Statutory will forms look like regular form wills. A testator first fills in information identifying herself, then adds a description of her devises of real and personal property. She names an executor to administer her will and a guardian for her minor children, if applicable. The statutory will specifies how many witnesses must affirm the testator's signature. Wills written in the testator's hand are valid in most states in emergency conditions. However, some states accept handwritten wills in all circumstances. These testaments, also termed holographic wills, are valid when written entirely by the testator, without any typed information. Holographic wills do not require witnesses: the testator dates and signs the will to execute it. A testator should research her state's probate code to ascertain whether it approves the holographic will procedure. You manage your assets and care for your family during your lifetime; a valid will extends your influence past your death by providing written instructions for distribution of your assets and care of your children. Americans dying without a will cede these choices to the state. While some hire attorneys and tax advisers to draft testaments, many people create their own valid wills using simple form wills or self-prepared testaments. Can a Notary Make a Power of Attorney Document? A notary, also called a notary public, serves an important function in verifying the authenticity of legal documents and signatures. A notary may also witness signatures or depositions associated with a power of attorney. However, under most circumstances, a notary cannot draft a power of attorney unless she also holds a license to practice law. What Are the Benefits of Wills?